All things were made through Him, and without Him nothing was made that was made. In Him was life, and the life was the light of men. And the light shined in the darkness, and the darkness comprehended it not. Christ became man 2000 years ago, but saying he was "born" on Christmas Day is true in only one sense. 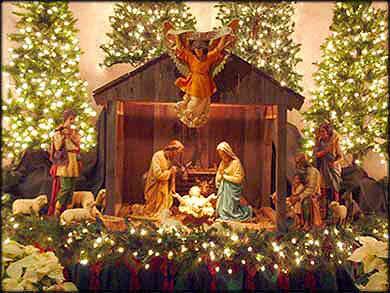 He was born of woman on Christmas, made flesh and blood, a fully human part of our world; but He existed at the beginning of time. John tells us that in the beginning, He was with God, and was God. of Christ is rising above the chaos. This is one of the most powerful passages in the Bible. It is a bit hard to understand, because it is philosophical and poetic, so it benefits from repeated reading, reflection, and meditation. Like all great poetry, it is not made to be read straight through quickly; it is made to be read time and time again. It parallels Genesis 1:1, even starting with the same phrase, "In the beginning". The first sentence establishes two of the great tenets of Christianity. The "Word" is Christ. Thus, this passage tells us initially that Christ existed from the beginning of time. Secondly, it establishes the mystery of the Holy Trinity, by the perplexing statement, "the Word was with God, and the Word was God". How can Christ be with God, yet be God? It defies human logic. This is John's Christmas story. Just as Matthew and Luke begin with detailed accounts of the physical, historical way in which Jesus was born, John tells the story of how Christ came to be with us in a theological way. He tells the story from backstage, instead of the audience, that we might fully appreciate that Christmas was the day when "the Word became flesh and dwelt among us."